We left out of Greeley Colorado an hour or so before sunrise. Our plan was to arrive at the Cedar Creek wind farm just after daybreak to begin the safety training for the turbine climb. As the asphalt turned to gravel and the sun began breaking over the horizon, the wind turbines became visible off in the distance. With many miles left to drive, they were little more than tiny black dots silhouetted against the orange sky. As we drew closer, the size and number of turbines seemed to grow until we found ourselves almost lost in a forest of enormous, majestic towers all spinning slowly in the morning wind. 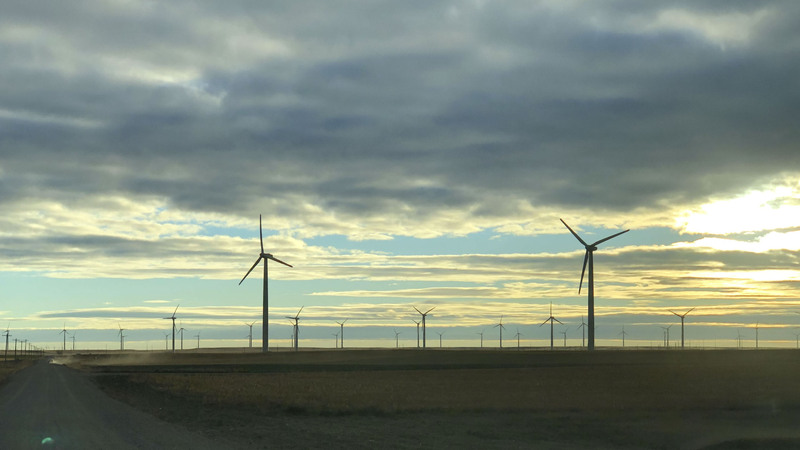 The Cedar Creek Wind Farm is located about two hours drive northeast of Denver, Colorado. Its 397 wind turbines produce 550 megawatts of electricity which travels along 80 miles of transmission lines to feed into the regional utility’s grid. My host for this visit was Greg Wolf, the CEO of Leeward Renewable Energy, one of the largest wind power operators in the US. As we arrived at the Cedar Creek operations center, we were met by his colleagues, John and Bob. They would be my trainers and fellow climbers for the morning’s adventure. They were among the dozen or so people who worked out of a set of squat, tan, metal buildings – the only hint of civilization among endless miles of plains. After watching safety videos and signing waivers, we hopped into a beefed up Ford pickup truck and set out to turbine H51. Gravel roads gave way to dirt and we eventually arrived. As I stepped out of the truck and craned my neck back to see the top of the tower, I suddenly grasped the essence of wind energy. It’s all about size. The wind turbine was enormous. Wind becomes stronger and more consistent the further you get from the ground. To capture the most power, engineers have spent decades making turbines taller and blades longer. As I stood at the base of the tower, contemplating climbing a 250-foot ladder, I felt little solace knowing that the GE 1.6 – 82.5 Class IIIB Wind turbine was one of the shorter models in commercial use today. The wind was so strong, we quickly retreated inside the turbine tower to finish putting on our gear. Inside the tower’s base was a room, maybe 20 feet wide with a corrugated metal ceiling 8 feet over our heads. Electric panels on both sides made a narrow path from the door to a ladder at the far end. We shut the door, turned on the light, and wrapped our harness straps over our shoulders and between our legs and clicked everything in place. Bob stepped to the ladder and climbed up a few rungs, unlatched the hatch and disappeared. I followed and John came behind me. Falling 10 feet can be terrifying. Falling 80 feet is fatal. Fortunately, the safety system was surprisingly simple and effective. Attached to my harness was a clamp that wrapped around a cable that ran all 250 feet up the front of the ladder. By pressing on a latch with one hand and opening a jaw with the other, the clamp wrapped the wire. The cool part was that the clamp could easily go up the cable but wouldn’t go down. I could climb up the ladder, effortlessly pulling the clamp up the cable along with me. But if I slipped, the clamp wouldn’t budge so I would just fall a foot or two and dangle next to the ladder (fortunately, I never had the opportunity to test this). So up I went. I took Bob’s advice and grasped the outside of the ladder rather than the rungs. Per my safety training, always keeping three-point contact. Hand over hand, foot over foot. For the first few dozen feet, I steeled myself to only look forward and ignore how high I was getting. Before he agreed to arrange the climb, Greg asked me three questions. Question 1 – was I afraid of heights? I told him no more than the next person. But as I hung there, maybe 30-40 feet off the ground, curiosity got the better of me. I was going to put my answer to the test. I readied myself as I looked down. The reality immediately rushed in. Wow. This was high. But it was the glance upwards that rocked my world. Somehow the next floor being so, so far away and nothing but ladder above me sent a shock through me. I settled myself and resumed climbing. 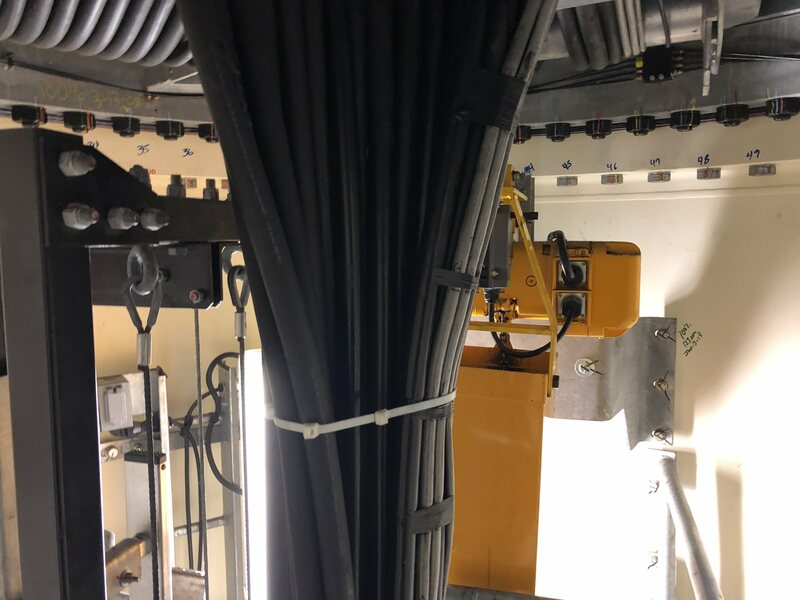 As I emerged through the hatch onto the third floor, John showed me how to connect the other harness clamp to a metal loop on the wall. I then disconnected the cable clamp so I could step aside and Bob could make the climb behind us. It was only then that I realized my legs weren’t nearly as tired as I expected but my forearm muscles were burning. Apparently, all those squats I’d been doing for weeks paid off but I didn’t anticipate how hard it would be to hold myself 18 inches away from the ladder for so long. We climbed. We clamped. We rested. Again. And then again. My arms were protesting vigorously as we approached the final floor but we made it in one piece. For the first time in 30 minutes, the ceiling was no longer shrouded in darkness but it was a mere 7-8 feet over our heads. 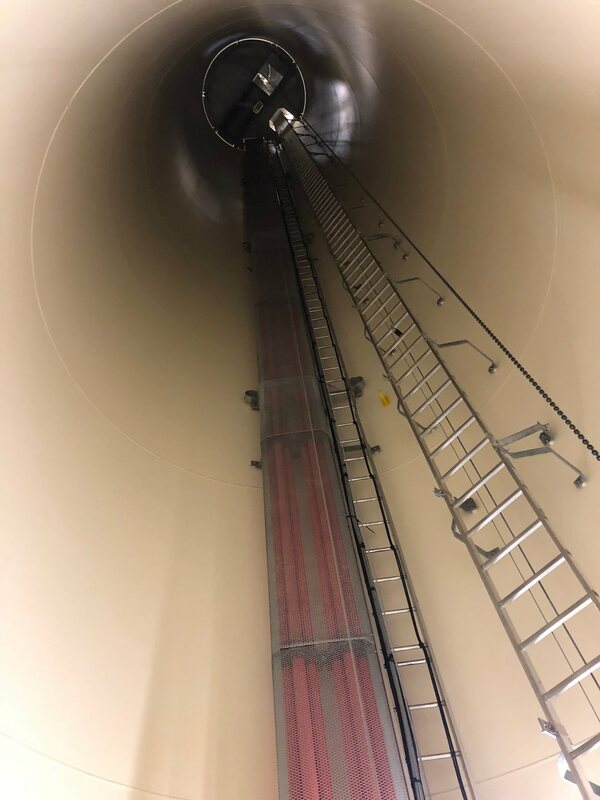 We had reached the bottom entrance to the nacelle – the part of the turbine that connects the blades to the gearbox and generator. This was where Greg’s second question became relevant – was I afraid of small spaces? The tower had narrowed greatly as it approached the nacelle. The bundle of wires which had seemed incidental on the first floor now took up much of the tiny space that John and I squeezed into. John pulled down a short ladder and we climbed upwards. We were in the nacelle. 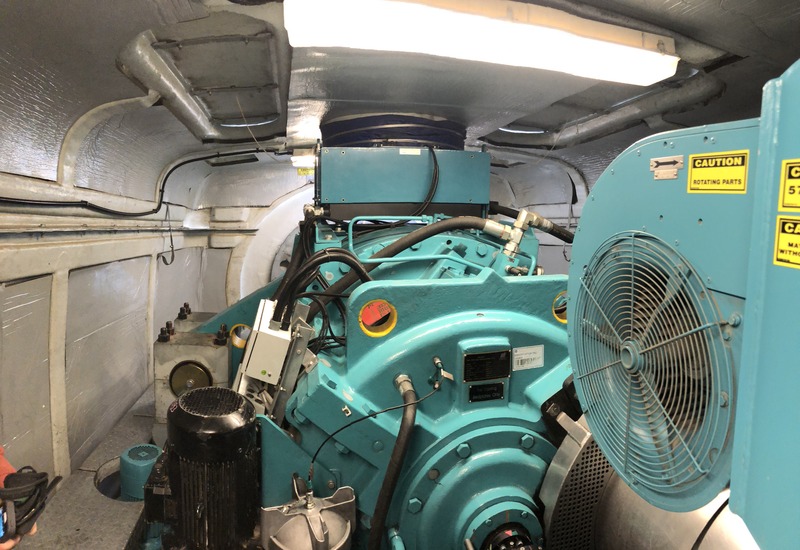 The small room was full of enormous metal structures – the drive shaft, the gearbox, and the generator. Together they were the size of two minivans. Bob offered me an introductory lesson on how a turbine works, from the four giant motors that turn the nacelle into the wind, to the port where you put fresh oil into the gearbox. As we sat in the nacelle, Greg’s third question jumped to mind. Do I get motion sickness? Like being deep inside a boat during rolling seas, the nacelle slowly swayed back and forth as the wind buffeted the turbine. Fortunately, I was too excited to worry much about it and we were moments from rectifying the problem anyway. John crawled over to the drive shaft and began unlatching a frosted plastic hatch. He popped it open, stood on the shaft and pulled himself up. His legs disappeared. I heard him clicking his clamps onto something. I made my way to the drive shaft. I stood up on it and discovered a view of the world I had never seen before. It was magnificent. Dozens of turbines surrounded me, seemingly below me, lazily spinning in the wind. As I turned, I saw the blade of our turbine, locked in place next to me. It was enormous. Its curves were beautiful as it extended 120 feet into the sky – another 12 stories above my head. Being on top of the nacelle reminded me of sailing. We harness tiny bits of this eternal force called wind in the pursuit of some human activity. Like a sailboat, the wind turbines surrounding us seem to create a near-spiritual connection between nature and humanity. John and I sat up there for what seemed like hours. When I first made it on top, the wind was so strong, we had to shout to hear each other. Later, it died down to a breeze only to pick up again a few minutes later. While the fluctuations made it all feel even more natural and real, it reminded me of the fundamental challenge facing clean energy from the sun and wind – intermittency. Can you imagine a power company telling their customer, “I’m sorry your TV and lights went out but the wind died down – I’m sure it’ll pick up again in a moment”? On this amazing adventure, I learned that turbines are getting larger and larger with each new model. Turbines being installed today can generate more than twice as much power with some models generating three-times as much. Things start to get even more interesting when wind turbines go offshore. Suddenly, the logistics of delivering ever larger turbine blades across highways disappear and the size constraints melt away. 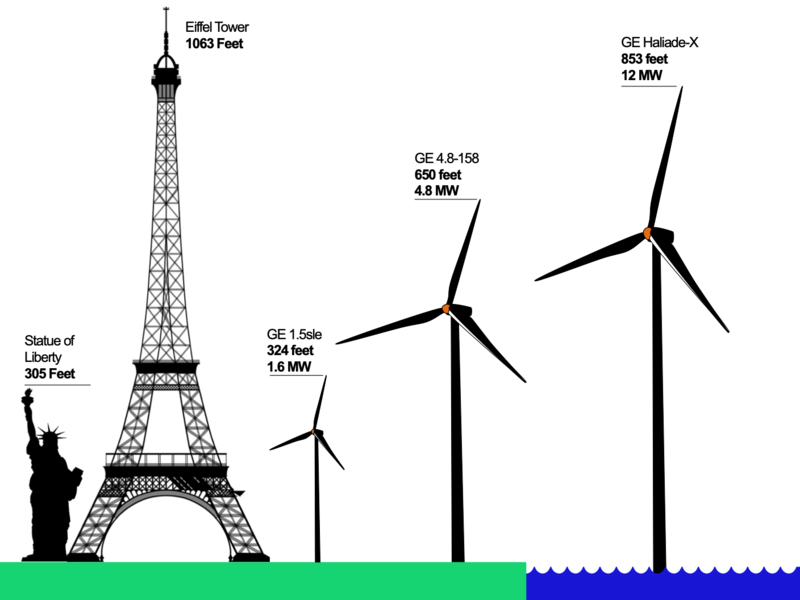 When the latest wind giant from GE, called Hallaide-X, ships in 2021, it will be nearly as tall as the Eiffel tower and produce 8 times more energy than the tower I climbed. I also learned that wind turbines require active control to face the wind and it’s all managed by computers. Other than the maintenance and the occasional repair, these giant, gorgeous, magnificent machines just sit there producing floods of electricity for tens of thousands of homes throughout the region. Their expected lifetimes of 20-25 years are likely to be decades longer as engineers find cost-effective ways to keep them running. Wind power is far from perfect. It will still require fossil fuels to keep people’s TV and lights on when the wind dies down – at least until batteries get cheaper. That being said, wind is already the cheapest way to generate electricity and it’s only going to get cheaper. But, it took being 250 feet in the air and experiencing the dance of wind and blades all around me to drive home the most important lesson of all. Wind was here long before us and it will be here long after we are gone. We only need to harness the tiniest fraction of its immense capacity and we can power our world many times over – and the wind and the planet won’t even notice. With the turbines receding into the distance, I began to notice something that had been hidden by the pre-dawn light on the drive out there. Everywhere I looked, in every direction, the fields and farms and plains were dotted with the machinery of oil and gas. Hundreds of derricks, tanks, pipes, and wells. A few were slowly bobbing up and down sucking oil from the earth. Many others seemed abandoned, rusting in the midday sun. I was seeing the other side of the energy system that, along with the nearby wind, sustains every part of our modern society. As I drove back towards civilization, I felt like I had been a witness to the evolution of energy, its past, its present, and its wonderful future. The state of Colorado is a state of national importance. “My host for this visit was Greg Wolf, CEO of Leeward Renewable Energy, one of the largest wind power operators in the United States.” 25 – 11- 2018. BILLE NUSSEY. I will not talk much about renewable energy – this is a dead-end branch of energy development. Quote: “The strongest gusts of wind recorded on Earth are associated with a tornado — up to 500 km / h. (In the epicenter of hurricanes – 260-300 km / h.) Professor Theodore Fujita from Chicago is working on this problem. “The Fujita scale provides for 6 categories of tornado power, according to which the maximum category F5 with a wind speed of more than 417 km / h is characterized as“ incredible ”. If a tornado of such power passes through a populated area, then practically nothing will be left of it. ” Reported: “Weather”. Here nothing needs to be counted and predicted by RES – they will be destroyed by the winds without the possibility of their recovery. But let’s move on from dead-end technologies to current technologies that can work for hundreds of years or more. These are hydroelectric power plants: large, medium, and small – for one or several farmers. The first. I produce chilled fresh water, and replenish the rivers on schedule: In the first year – by 15%. In the second – by 20%. In the third – by 30%. And in the fourth – by 35%. I provide hydroblocks with uninterrupted water – and I increase hydropower production by 20-30%. Plus, the availability of water will ensure the intensive development of hydropower. In parallel: I will ensure the growth of productive land, pastures, which will allow one and a half to two times to increase the production of agricultural products, meat, milk and fish. Here, the yield will be about 7-9 billion dollars. I pay special attention to the restoration of the Colorado River. Quote: “Once the mighty Colorado river no longer even reaches the ocean? More than 40 million people depend only on this river alone. Denver, Los Angeles, Las Vegas, Phoenix, Tucson, San Diego, Salt Lake City, Albuquerque and Santa Fe are all dependent on the Colorado River. Here, the yield from only the sale of drinking water will be 17-18 billion dollars. The final indicator of the work of the entire state, and my innovations – will be to bring the state of Colorado to 0.5 trillion. dollars for 5-6 years. Штат Колорадо – штат национального значения. Цитаты: «Вечерняя ферма Cedar Creek расположена примерно в двух часах езды к северо-востоку от Денвера, штат Колорадо. Его 397 ветровых турбин производят 550 мегаватт электроэнергии, которая проходит по 80 милям линий электропередач, чтобы прокормить сеть региональных коммунальных служб». «Моей принимающей стороной для этого визита был Грег Вольф, генеральный директор Leeward Renewable Energy, одного из крупнейших операторов ветроэнергетики в США». 25 – 11- 2018. БИЛЛЕ НУССЕЙ». Я не буду много говорить о ВИЭ – это тупиковая ветвь развития энергетики. Цитата: «Самые сильные порывы ветра, зафиксированные на Земле, связаны с торнадо – до 500 км/ч. (В эпицентре ураганов – 260-300 км/ч.) Над этой проблемой работает профессор Теодор Фуджита из Чикаго. «Шкала Фуджиты предусматривает 6 категорий силы торнадо, согласно которой максимальная категория F5 со скоростью ветра более 417 км/ч характеризуется как «невероятная». Если торнадо такой силы пройдет через населенный пункт, то от него практически ничего не останется». Сообщают: «Метеовести». Здесь ничего не нужно считать и прогнозировать по ВИЭ – они будут разрушаться ветрами без возможности их восстановления. Но, перейдём от тупиковых технологий к действующим технологиям, которые могут работать сотни лет, и более. Это гидроэлектростанции: большие, средние, и малые – для одного, или нескольких фермеров. Первое. Я произвожу охлаждённую пресную воду, и пополняю реки по графику: В первый год – на 15%. Во второй – на 20%. В третий – на 30%. И в четвёртый – на 35%. Я обеспечиваю гидроблоки бесперебойной водой – и увеличиваю производство гидроэнергии на 20-30%. Плюс, наличие воды позволит обеспечить интенсивное развитие гидроэнергетики. Параллельно: я обеспечу прирост продуктивных земель, пастбищ, что позволит в полтора-два раза увеличить производство сельхозпродукции, мяса, молоки и рыбы. Здесь доходность составит порядка 7-9 млрд. долларов. Особое внимание я уделю восстановлению реки Колорадо. Цитата: «Когда-то могучая река Колорадо больше даже не достигает океана? Более 40 млн. человек зависят только от одной этой реки. Денвер, Лос-Анджелес, Лас-Вегас, Феникс, Тусон, Сан-Диего, Солт-Лейк-Сити, Альбукерке и Санта-Фе – все эти города зависят от реки Колорадо. Здесь доходность только от продаж питьевой воды составит 17-18 млрд. долларов. Конечным показателем работы всего штата, и моих новаций – будет доведение ВВП штата Колорадо до 0,5 трлн. долларов за 5-6 лет.